For more than 30 years, General Southwest has served the needs of arborists in the Phoenix metro area and throughout Arizona. We understand that tree maintenance is a dangerous business, involving heavy limbs, sharp equipment, and high places. It’s important to make sure your insurance coverage is properly tailored to the work you do. You don’t want to pay too much, but you need to make sure you’re covered should you ever experience a loss. A chain saw slips due to a large knot, and the kick-back seriously injures your lead employee? Someone breaks into your storage facility and steals several expensive chain saws? A heavy branch falls in an unexpected way, and crushes a small car parked nearby? These situations, along with many others, can cripple or permanently destroy your business if you don’t have the right insurance protection in place. General Southwest advisors take the time to understand your business, so you get the coverage you need. And because we are independent agents, we do the comparison shopping for you to find the best deal. 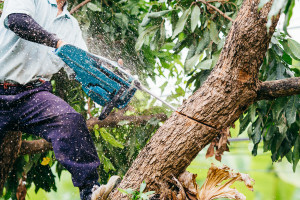 General liability insurance: This basic liability policy covers many of the liability risks all businesses face, such as property damage and bodily injury that you or your employees cause while performing tree care, removing trees or driving to and from job sites. Professional liability insurance: If you provide landscaping and tree care advice, professional liability or “errors and omissions” coverage can provide protection against liability claims due to negligence, poor advice, or recommended services that result in a client’s loss. Business property insurance: The coverage you need for your business property and equipment depends on whether you work out of an office space, whether you own your business premises, and the equipment and tools you use on the job. Inland marine insurance: This policy protects equipment and cargo that you transport from one job site to another. For example, if you use a computer in the field, your inland marine insurance would typically provide protection. These policies vary by insurer, so it’s a good idea to discuss the specifics with your agent. Commercial vehicle insurance: This insurance policy will provide coverage similar to your personal auto insurance, but will be specific to your commercial vehicles and drivers. Note that a personal auto policy is typically not sufficient to cover cars, vans and trucks used for commercial purposes. Workers compensation: Workers comp is required in all states, although the laws vary from one state to another. In some states you only need to carry workers compensation if you have three or more full time employees, for example, while in others you need to carry a basic workers compensation policy whether or not you have employees. This policy will cover job-related injuries or illnesses and lost income. You’re an expert on trees. It’s why people call you. General Southwest advisors are experts on insurance, and that’s why you should contact us for a complimentary evaluation of your business insurance. Give us a call today, or fill out the consultation form on this page.